I know he's not new or anything and I've enjoyed his shows. But ever since eating at Bobby Flay's Mesa Grill in Las Vegas, I've been kind of enamored with him and his style of cooking. Our brunch was so over-the-top delicious that it propelled me into an infatuation with modern tex-mex. He uses all the familiar mexican ingredients but the combinations are bright and fresh and just a little different. I bought the Mesa Grill Cookbook and have been spending a lot of time with it. The photography in the book is gorgoeous and all the dishes sound so enticing. But the recipes are complicated. There are a number of garnishes and sauces to be made before you can get on with the making of the actual dish. This is the kind of cooking you do for fun, not when you're under pressure to get dinner on the table. So I've started with probably a couple of the least complicated and time-consuming dishes in the book. A Roasted Cauliflower and Green Chile Soup and a Honey and Chile Glazed Salmon with Black Bean Sauce and Jalapeno Crema. If you've made a Cauliflower Soup, you'll find no surprises with this one. Instead of steaming the cauliflower, you roast it and then it gets pureed with chicken broth and reheated with a little cream. The twist is that you make a roasted poblano puree and swirl that into the soup. This give it some heat and a little interest. There also what he dubs "goat cheese taquito" you float on top for a little garnish. These are really just a warm goat cheese nacho but the crunch of the chip and the tang of the goat cheese lend a lot to the simple bowl of soup. I searched the web but could not find a link to recipe for you. Let me know if you really want it and I'll get it to you. Next up is the Honey-Ancho Chile Glazed Salmon with Black Bean Sauce and Jalapeno Crema. But first I wanted to show you the lovely wild coho salmon I had to work with. 'Tis perfect, I think. Okay, so the title of thi recipe pretty much says it all and actually the dish is pretty simple to execute. The glaze is just honey, dijon mustard and ancho chile powder. The black bean sauce is black beans, chicken broth, onion, garlic, cumin, and a chipotle whirred up in a blender to a smooth sauce. And the jalapeno crema is sour cream blended with a roasted, jalapeno puree. 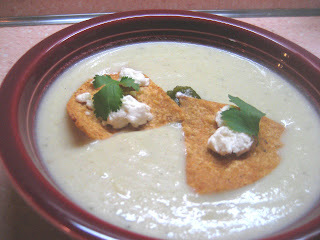 Instead I used some of the poblano puree that I had leftover from the soup prep. And I spiked it with some green chile tobasco. I also adapted the recipe by using a can of black beans instead of cooking my own. You can find the exact recipe and a detailed description of the preparation here. The black bean sauce goes down on the plate and the glazed salmon sits on top. Then you dollop some of the jalapeno cream around. My picture isn't as pretty as the one in the book. If you put the cream in a squeeze bottle you could be really fancy. I had some pineapple salsa in the fridge so I put a little on top of the salmon too. The star of the show is the black bean sauce. Really delicious, smooth and creamy. I ate the leftover beans with eggs, salsa and tortillas this morning. .... doesn't get better than that. I like his food. I've eaten at Bolo in NYC and at Mesa in LV. Your picture looks scrumptious! John and I are doing this recipe tonight! Move over Bobby! There's a new kid in town and her name is Toni! !